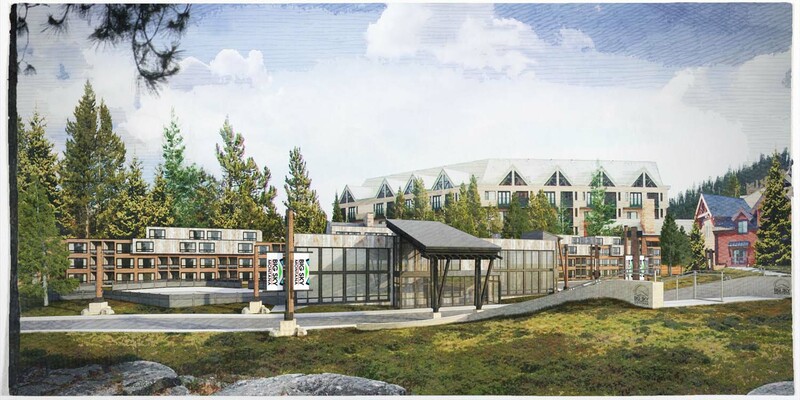 The Huntley Lodge at Big Sky Ski and Summer Resort is getting a renovation! The Huntley Lodge was the first lodge at the base area of Big Sky Resort. Built in the 1970’s it is a bit of an icon for the people that have visited this resort over the years. Now the pumpkin colored siding is finally coming off or being painted over for Phase I of this renovation.The rustic vertical wood siding we are using is a new wood made to look older. Select Timber Products is doing a custom stain that has a white washed effect but with warm brown tones that show through. This style of wood along with the new paint color interact much better with the surrounding buildings. Phase II of this renovation consists of adding a couple entrance pieces to the side of the lodge facing slope-side. This will help with the programming of this area of the lodge as is signifies an arrival.